What is the difference between fatigued driving and drowsy driving? How common is fatigued driving? How does fatigue cause crashes? Who is most at risk to drive while fatigued? Why are young drivers more likely to drive fatigued? What are the driving behaviours of a fatigued driver? What are the common characteristics of a fatigued-related crash? When are fatigue-related crashes most likely to occur? What does the public think about fatigued driving? 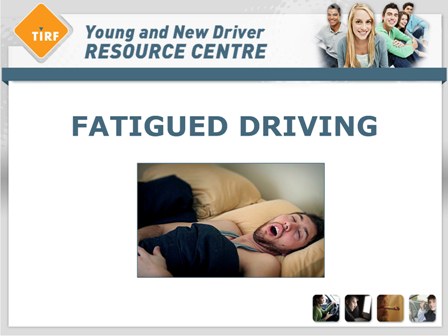 What do young drivers think of fatigued driving? Why is a fatigued driver dangerous? How does alcohol interact with fatigue? Are there provincial/territorial fatigued driving laws? How are fatigued drivers dealt with by the police? What needs to be done on our roads and what strategies are available to the public to decrease fatigued driving? Why isn’t there more data available on fatigued driving? What should a young driver do to prevent fatigued driving? What should a driver do if they begin to feel fatigued while driving? Fatigue is a disinclination (or unwillingness) to continue performing the driving task at hand. This can occur as a result of repetitiveness of either the driving task or the driving environment, or can occur after driving for extended periods without a rest or break. Drowsiness is a product of the human body’s natural circadian rhythm or ‘sleep-wake’ cycle. Most people feel sleepy twice a day – in the afternoon and at night.1 Teenagers need at least nine to nine and a half hours of sleep a night.2 Without the proper amount, drowsiness occurs and once a person is tired there is no cure for drowsiness other than sleep itself.3 Thus, driving can be affected by this natural cycle. The results of fatigue and drowsiness are the same and can be considered together. The driver is less alert and less attentive and can fall asleep. Both of these conditions reduce the ability to drive.4 Given that the consequences of fatigue and drowsiness on driving are the same, both terms are often used interchangeably. Crash data analysis shows that 26.4% of all fatal and injury crashes in Ontario (excluding property damage collisions) are fatigue-related.6 Similar to Canada, in the United States it is believed that up to 20% of serious crashes may be due to fatigue. Estimates place the number of fatigue-related crashes between 79,000 and 103,000 per year with 1,500 fatalities annually in the US. There are two types of modes a driver can experience due to fatigue. The first is ‘sleep mode'.7 This causes the driver to be under-aroused which typically leads to drowsiness. The driver begins to drive without awareness, no longer giving the proper amount of attention to the task of driving.8 Errors of neglect are made, meaning the driver fails to perform important driving tasks (e.g., braking in time, staying in their lane or staying on the road). The second is 'overload mode'.9 This is characterized by the driver feeling over-aroused due to mental overload and irritability. This causes the driver to make dangerous errors, such as aggressive driving (e.g., road rage) or multi-tasking while driving. Both of these modes increase the chances of crashing. The lifestyle of teens plays a major role in their likelihood of driving fatigued but biological changes play a role as well. They often do not get enough sleep because they stay up late to study, work, or socialize15 but it is also their circadian clocks that make it difficult for them to fall asleep until later in the night. Night time sleep declines over the teen years and teens are more likely to sleep in on the weekends to make up for their late week nights. Teens also experience a decrease in alertness when awake which begins in mid-puberty. These physical changes paired with the experimentation and limit-testing behaviours that are common to teens16 make them quite vulnerable to driving while fatigued. The most common time periods for fatigue-related crashes are mid-afternoon (3 pm-6 pm) and late at night/early morning (12 am-7 am). These time periods pose similar risk for a fatigue-related crash: a study conducted by Tefft (2010) found that approximately the same percentage of people report falling asleep during the time periods of 12 pm-5 pm and 12 am-6 am (26.1% and 24.7% respectively).23 It is nor surprising that these time periods are the most risky, our bodies have a circadian rhythm (common sleep pattern) that makes us sleepy in the afternoon and late at night.24 These sleep-wake cycles cannot be avoided or ignored. Public opinion polls show Canadians believe the dangers of fatigued driving can be controlled easily because they think there are several options available for dealing with the effects of fatigue.26 Studies show that the public underestimates the frequency of fatigued driving. In a survey conducted in Ontario, respondents estimated four out of ten drivers drive while fatigued when in reality six out of ten actually do so. Ontario drivers are less concerned with fatigued driving than most issues – they think that people are more likely to engage in other types of risky behaviour (such as drinking or speeding). Drivers do not think they are likely to be caught driving while fatigued, nor do they think their chances of crashing are very high. This is especially true for males.27 Respondents ranked getting to their destination on time as more important than taking breaks in order to rest. A study conducted in 2010 investigating why young drivers would drive while fatigued found that peer approval, perceived risk and optimism bias were all factors.28 This means that young drivers are not afraid of getting caught or getting into a crash while driving fatigued, and they do not think it is likely they will experience the same fate as other fatigued drivers who did get caught or crashed (the ‘it won’t happen to me’ attitude). People are not good at judging how likely it is they will fall asleep.30 Many drivers do not feel drowsy or recognize drowsiness. Some drivers who were in a fatigue-related crash reported they did not feel tired before the crash. Drivers are also confident they can handle the situation if drowsiness occurs. Once a driver is drowsy it is much more difficult to overcome this feeling than if the driver had avoided becoming drowsy in the first place. Drinking alcohol, even small amounts, when fatigued is quite dangerous. Fatigue heightens the effects of alcohol, impairing the driver even more so than fatigue alone.32 The ‘overachiever’ teen, who is most at risk for fatigued driving, is also known to socialize and attend parties often, which creates more opportunities for them to consume alcohol, even if it is just one or two drinks. The following figure shows how alcohol can affect fatigued driving.34 With less sleep, alcohol has been shown to be associated with many more “off-road deviations” indicating that alcohol does compound the effects of fatigue. Public education combined with increased efforts by government to implement fatigue-reducing road infrastructure would help to decrease the frequency of fatigued driving. Drivers should take necessary measures to avoid fatigued driving before beginning trips and roads should be equipped to help drivers achieve fatigue-free driving. It is very difficult to determine if fatigue is a factor in a crash, especially if the driver did not survive.39 This makes it hard to collect accurate statistics on the magnitude of fatigued driving. There is no instrument to measure fatigue, unlike alcohol.40 Once an officer is on site he or she cannot physically measure if a driver is fatigued. Because crashes commonly occur at night, it is less likely there will be any witnesses to the crash. The driver involved in the crash is not likely to admit that they dozed off or were drowsy at the time of the crash. Research is underway in countries such as Australia and Finland to develop tools to better detect driver fatigue. Once these tools are available, police can more accurately record fatigue-related crashes and these statistics can strengthen the growing research on fatigued driving. The top reason drivers report falling asleep at the wheel is because of lack of sleep the previous night.41 The lifestyle of young drivers facilitates the likelihood that they will also experience an extreme lack of sleep. Young drivers need to be conscious of this and compensate by either sleeping more or finding other modes of transportation when they are particularly tired. Researchers suggest that the best strategy to deal with fatigue is to prevent it. Getting enough sleep before any long trip (and ideally, any driving in general) or a nap before driving will decrease the likelihood of crashing due to fatigue. Young drivers have a much higher risk of crashing at night than during the daytime, which is why graduated driver licensing programs developed night time restrictions. These restrictions have led to a 60% decrease in night time crashes of young drivers.42 Passengers can prevent fatigued driving by asking the driver if they are tired. If they are, the passenger should discourage them from driving. When experiencing fatigue, young drivers are more likely to turn on the radio, open a window/turn on the AC, talk to passengers, sing or use their cell phones to stay alert.43 These strategies are actually more distracting than helpful and increase the risk that the driver could crash. The only effective method for dealing with fatigue while driving is to prevent it. Drivers should take breaks at least every 2-3 hours so that fatigue does not become an issue. If this is not possible, and fatigue has already occurred, drinking caffeine and taking a nap have been found to temporarily help drivers deal with drowsiness.44 A study found that both actions relieve fatigue, but only for a few hours.45 Regardless of the ability to hold off sleepiness for a few extra hours with naps or caffeine, a driver should always plan to have the proper amount of rest before a trip and plan ahead for adequate break periods, because once a driver is fatigued, the impairment cannot be reversed. Bohan, J.S. (2006). Coffee or Nap? Journal Watch Emergency Medicine. Massachusetts Medical Society. Cansfield, D. (February 2008). Closing Remarks from Ontario’s Minister of Transportation. Working Together to Understand Driver Fatigue: Report on Symposium Proceedings. Highway Safety Roundtable. Toronto, Canada. Carskadon, M.A. (1989/1990). Adolescent Sleepiness: Increased Risk in a High-Risk Population. Alcohol, Drugs and Driving. 5(4)/6(1): 317-328. Elzohairy, Y. (2007) Fatal and Injury Fatigue-Related Crashes on Ontario’s Roads: A 5-Year Review. Highway Safety Roundtable & Fatigue Impairment, Driver Fatigue Symposium, Toronto, May 16th 2007. Fernandes, R., Soames Job, R.F., Hatfield, J. (2007) A challenge to the assumed generalizability of prediction and countermeasure for risky driving: Different factors predict different risky driving behaviours. Journal of Safety Research. 38(1): 59-70. Fernandes, R., Hatfield, J., Job Soames, R.F. (2010). A systematic investigation of the differential predictors for speeding, drink-driving, driving while fatigued, and not wearing a seat-belt among Young Drivers. Transportation Research Part F. 13(3): 179-196. Horne, J.A., Reyner, L.A. (2003). Driving impairment due to sleepiness is exacerbated by low alcohol intake. Occupational and Environmental Medicine. 60(9): 689-705. Marcoux, K. Vanlaar, W. Robertson, R. (2012). The Road Safety Monitor 2011. Fatigued Driving. Traffic Injury Research Foundation. Ottawa, Canada. Moller, M.J., Kayumov, L., Bulmash, E.L., Nhan, J., Shapiro, C.M. (2006). Simulator Performance, microsleep episodes, and subjective sleepiness: normative data using convergent methodologies to assess driver drowsiness. Journal of Psychosomatic Research. 61(3): 335-342. National Highway Traffic Safety Administration (NHTSA). (March 2006a). Drowsy Driving and Automobile Crashes. NCSDR/NHTSA Expert Panel on Drive and Fatigue and Sleepiness. National Highway Traffic Safety Administration. (September 2006b). Teen Unsafe Driving Behaviours: Focus Group Final Report. DOT HS 810 670. U.S Department of Transportation. Washington, DC. Robertson, R., Holmes, E., Vanlaar, W. (2009). The Facts About Fatigued Driving in Ontario: A guidebook for police. Traffic Injury Research Foundation. Ottawa, Canada. Roehrs, T., Beare, D., Zorick, F., Roth, T. (1994). Sleepiness and Ethanol Effects on Simulated Driving. Alcoholism, Clinical and Experimental Research: 18(1): 154-158. Smiley, A. (February 2008). Strategies for Reducing Fatigue Related Crashes. Working Together to Understand Driver Fatigue: Report on Symposium Proceedings. Highway Safety Roundtable. Toronto, Canada. Stutts, J.C., Wilkins, J.W., Vaughn, B.V. (1999). Why Do People Have Drowsy Driving Crashes? Input From Drivers Who Just Did. Washington DC: AAA Foundation for Traffic Safety. Tefft, B. C. (2010). Asleep at the Wheel: The Prevalence and Impact of Drowsy Driving. Washington, D.C.: American Automobile Association Foundation for Traffic Safety. Wan den Berg, J., Landstrom, U. (2006). Symptoms of Sleepiness while driving and their relationship to prior sleep, work and individual characteristics. Transportation Research Part F: Traffic Psychology and Behaviour. 9(3): 207-226. Vanlaar, W., Simpson, H., Mayhew, D., Robertson, R. (2007). Fatigued and Drowsy Driving: Attitudes, Concerns and Practices of Ontario Drivers. Traffic Injury Research Foundation. Ottawa, Canada.